Living alone is a situation where you will be staying all alone and taking care of the things, like ood, finances, bills and other requirements all by yourself. In this modernized society living alone can be considered as complete freedom over one’s decision with their life. In the process of living alone, a person can understand the importance of their own decision. Most of the people might consider it as a selfish decision which involves only one individual, but actually it is one of the selfless decision one can take. Therefore, living by yourself or alone can be challenging, but more than it can be more comforting than living with others as per their convenience. Initially living alone will be a little difficult, but with moving time you will get habituated to it. No internal disturbance with anyone. Have fun, even if your place isn’t IMPRESSIVE. Living alone for the first time will be a little hectic, you will be finding many issues and problems which you have never ever heard of. Here are few practical tips for living alone that can actually make a difference. Always have your keys in your hand when you close the door, so as to avoid forgetting them when you leave. Have a tool set that has a screwdriver with changeable heads. In case of power failure, you need to keep food and a flashlight around. Always keep bug-killing spray around. Its good to follow the one-minute (or two-minute, or five-minute) rule — just to fix small things. Have a fire extinguisher around, just in case of emergency. It is perfect time to experiment with your home decor, or customize it as per your taste. Its good to invite your friends at your place — this will help you avoid the loneliness. It is very important to be in touch with your loved ones, like your parents and friends. It is better if you have a home security system installed for your house. Be social and meet and greet your neighbors atleast once ina while. Don’t just sit at home, find reasons to leave your apartment atleast for a walk. Try things like cooking dinner every night, or on the weekends. You can also make few stuff ready so that it would be easy for you everytime you start cooking. If you are new to a place, find a meet-up group which does something that interests you. Prepare food at morning so that when you get home, you just need to heat it and serve directly. There are several advantages of being lonely, and the most important one would be living all by themselves. When a person decides to live alone in a house or own a place of his/her own can be the most exciting decision of their life. When a person lives with another roommate or other fellow mates, then at that time the most common problem one can face because of their roommates would be their cleanliness issues. As there are many disadvantages of cleanliness, some people are very clear about and maintain hygiene and cleanliness, but some don’t want to be clean or don’t want to keep their stuff clean. At that time, both roommates might face some sort of issues between them and this can lead them to fight more often. Most of the time living alone can provide calm and composed energy to a person, but in another format of living with people can create a little less of all that. Therefore, it is quite obvious that when a person decides to live alone, then he / she might experience some sort of calmness and silence in their life. And such type of silence can irritate some and some can even enjoy the silence in their life. It is up to a person living alone that whether he / she enjoys the silence of being alone in their house. It is very much obvious that when a person lives with people, whether it is family or friends then they should live with the expectation of all those people. But on the contrary, when a person decides to live alone, then these issues can be ignored and one of the best things that can happen while living alone would be that one can eat anywhere in their house. And there won’t be anyone to irritate them and lecture them about cleanliness and other stuff. Most commonly when a person decides to stay alone all by themselves, then one of the best things that can happen in his / her life is that people can enjoy his / her life without any interference. There won’t be anyone to tell one what to do and what not to do. Therefore, being alone and living alone can provide inner peace and freedom of designing their own life. One can live and create their own rules for their life without even thinking about others opinion. It is clear that living alone can let one take their decision without even others interference and this type of decision making makes one feel good about themselves. Therefore, when a person moves to a place where he / she decides to live by themselves, then they will definitely receive some sort of freedom in their life. The freedom of making their own decision, choosing their needs and wants and living as per their own like. People might have heard and seen these lines in their daily life and sharing that are caring, but when it comes to living with others and especially with those who don’t believe in sharing and who even like to share their stuff, then they must take up a decision of living alone and that would be best for all. It is actually true that when a person lives by themselves, then he / she doesn’t need to share any of his / her stuff with anybody. When a person lives with roommates and other fellow mates, then at that time it is quite obvious that a person might have to share his / her clothes to his / her roommate. But the worst thing is that some people don’t return those borrowed dresses or clothes and it gets tough for the owner of the dress to ask them back. Therefore, living alone can let one get rid of all those stuff easily and quickly. Taking a decision where a person decides to live alone can be one of the toughest decision that one can take in their life. And when a person takes such decision, then it is quite obvious to everybody that he / she can take full control of their life without consulting anyone. Therefore, living alone can provide courage and confidence to a person who really want to live their life on their own terms and who doesn’t require anyone else to interfere in their matters. Most probably freedom and independence is a term where in which a person considered to be free and independent only by their control over their life. And living alone can definitely provide freedom and independence to a person without any issue. When a person lives alone, then he / she might face a level of independence in their life. Such type independence to design their life, live like they always wanted and much more. Most of the time it is quite difficult for a person to decide what exactly they need to decorate their house or space with. And sometimes such types of decision can be made with others opinions. But actually there are people who don’t want anyone to design their decor for their space. Then that person needs to shift from the place and start living all by themselves to design their decor and to choose their own decor for their house or space. Most of the time when a person lives with roommates or any other friends, at that time they might have to wait for them late night. Waiting late night for roommates can be frustrating for anyone. Therefore, it is always better to live alone so that they avoid such late night waits for unnecessary friends and roommates. And once a person starts adjusting with such type of habits then it is quite possible that this habit can increase time in their life. As most of the above mentioned advantages of living alone can provide complete details about its benefits. In the middle of such benefits, a person can experience one more benefit and that is their privacy. While staying with roommates it is a common gesture that people follow with their daily life with greeting each other. Therefore, if a person decides to stay alone, then it is quite obvious that he / she does not need to greet anyone in their life. Some people don’t like to greet anyone in their life, but because they are staying with their roommates then they have to greet each other without any choice. Most of the time while staying alone in a house a person can experience complete freedom in their life. And while staying with others as he or she might have to think about those with whom they are staying in. But if a person takes a decision of staying alone in a place, then it is quite obvious that person can sleep anywhere in the house without anyone’s interference. While staying alone in a place, a person might experience some sort of independence with his or her decision making. If a person lives alone in a place, then it is quite noticeable to everyone that he or she can be anything in their house. They don’t have to lower their music volume and they don’t have to compromise their music listening type for the sake of others. Most of the while staying alone at a place a person can enjoy complete freedom in their life. But whereas in staying with others one have to compromise with their daily needs and wants. Therefore, all the things while living alone can create a better environment for their own self. As there are several types of advantages in living alone, similarly there is quite a list of the disadvantage of living alone that need to be explained. If living alone can let one decide their life with their own conditions, then these disadvantages can differentiate between the benefits and cons of living alone. And these disadvantages can provide better understanding about living alone. As it is quite obvious that when a person decides to live alone, then a possible possibility is that a person might be completely alone. Most of the people enjoy being alone, but not most of the time. There are certain things which people like to share with other people. But when a person lives alone, it is not possible to do things with others. Therefore, when a person stays alone, then it’s quite obvious to feel the lack of company. Most of the time when a person decides to stay alone in their place, then it is very common to feel a little bored with their daily routine. People who live alone feel bored most of the time and to overcome boring situation they need to spend most of their time with friends and family so that they can get rid of boredom in their life. And it is the worst feeling of being alone and staying alone in one place. The most common disadvantage of living alone would be the feel being alone. Sometimes some people like being alone in their life, but actually being alone is not that easy for anyone. Therefore, to live in a place alone a person a greater will power to succeed in their life. And to overcome that lonely feeling in their life, a person need to be around those who makes them comfortable in their life and in their place. As it is quite obvious that in a daily lifestyle of a person some might feel safe with their family and friends, but those who stay away from their home. Therefore, when a person decides to live alone in their place, then they need to be sure of safety in that particular place and that is because it is first and foremost thing to consider while living alone in one place. And eventually lack safety can create greater issues. When a person decides to stay alone and live alone, then at that time they need to consider being in touch with their family and friends, but most of the time those who decides to live alone in their life might lose all the contacts with their family and friends. Therefore, it is always better to be in touch with one’s family and friends, so that one can feel secure with and safe even after staying far from their loved one’s. Finally, the bottom line is that this discussion over living alone and their advantages along with disadvantages of living alone. 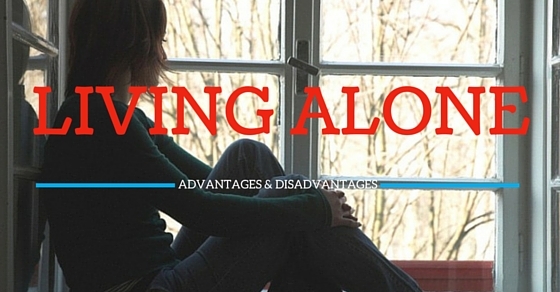 This information about the benefits and disadvantages of living alone can provide detailed differentiation of living alone. Therefore, this information about living alone can clear most of the confusion about the benefits and disadvantages of living alone. And those who are interested in understanding more about these advantages and disadvantages of living alone can help them make the correct decision in their life.